Versatile Sizing: Only one frame size is needed to fit riders from 4’1” to 6’3”. Lightweight Aluminum Construction: Weighs less than 45lbs complete with skis, mechanism and seat. 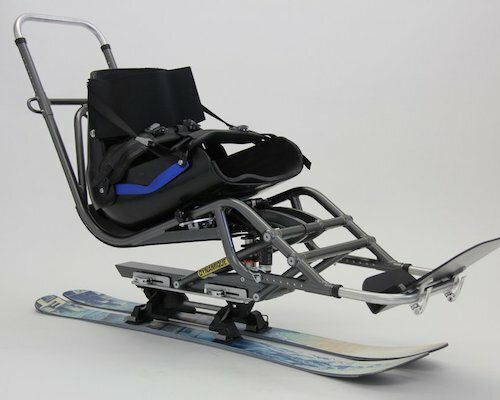 Loading the Chair Lift: The Dynamique has an unprecedented load height and its one of a kind, tensioned load system allows the skier to “sit down” on the chair, making loading and unloading very smooth. Sitting on the Chair Lift: The Dynamique moves the shock out of the way allowing the skier to sit all the way back against the chair. The rear frame triangle naturally leans the skier back eliminating any “teter” sensation. The industry’s largest skid plate facilitates getting on and off the chair. A-Arm Design: While most bi skis use single pivot suspension, the Dynamique uses a-arms like higher performance mono skis. They improve the ride and allowed us to engineer where the frame is in the load position. We “dowel test” skis to ensure the best ski performance. The Dynamique dowel tests similar in both the ride and load positions. This means it’s as easy to push in the lift line as it is to ski. Suspension: We use 3” of travel at the rear and 1” at the front to maintain a low center of gravity. Suspension is driven by an MRP Raze 2CR Shock. Developed for downhill and aggressive biking the shock is easy to fine tune (rebound, high & low Speed Compression) and readily serviceable. Footrest: The ankle angle is quickly adjustable with quick release clamps. The length is adjusted along the horizontal axis. Smaller skiers maintain a low centre of gravity and taller skiers do not have to worry about the footrest bucketing out. Seat Dump: Adjustable to 3 positions. The lowest position is flatter than any bi ski on the market while the upper is similar to a Bi-Unique glove seat. New Mega III Skis: The Mega III’s employ the same proven shape, side cut and camber as the Mega II’s but with a new and improved flex pattern. A stiffer core throughout adds the stability and performance needed for a suspension bi ski. It also makes loading and unloading the chair easier. Instructor Handles: The handle has been pushed back from the Bi-Unique to ease hands-on lessons and allow a reclined position for the ride and chair lift. The wide handle is shaped like a mountain bike handle bar. The swoopy ends provide an easy grip for picking skiers off the ground. The narrow handle takes note from the traditional Bi-Unique. Both handles are adjustable in height.